Free West Papua Campaign (NL) herdacht 1 december met een drieluik: het verleden, het heden en de toekomst van West-Papua. 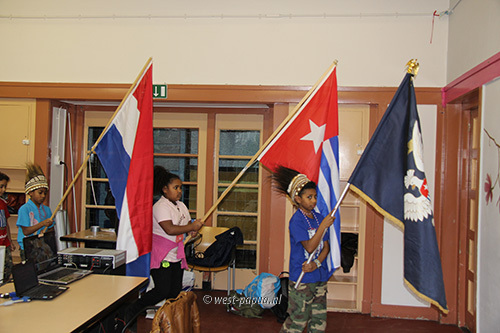 Bij aanvang was er een vlaggenparade door Papuajeugd met de Nederlandse vlag, de Papuavlag de Morgenster, en een vlag met het nationale wapen met de Kroonduif. The West Papuan Morning Star Flag was raised today at Port Moresby City Hall by NCD Governor Powes Parkop to mark the opening of the Free West Papua Campaign here in PNG. However, three West Papuan activists Freddy Mambrasar, Tony Fofoe and UPNG lecturer Patrick Kaiku were arrested by PNG Police after the flag raising ceremony was held. It was alleged that PNG government gave orders to arrest the West Papuan activists. Police claimed that the demonstration was illegal despite being sponsored by Port Moresby Governor Powes Parkop and many other government ministers. Governor Parkop personally escorted the three who were arrested to the waiting armoured Police vehicle. He told the crowd that "This will be fought through the courts" Despite the interruptions from the Police and immigration officials which are believed the Indonesian Government is behind, the flag raising ceremony was a success. Prior the ceremony, the organizer and West Papuan activist Benny Wenda was issued with restraining order by PNG Police and Immigration Official. Mr Wenda told Guardian Australia that "immigration officers in Papua New Guinea threatened to have him arrested along with an Australian lawyer for "engaging in political activities" and breaching their visa conditions'. However, the ceremony went ahead with the support from Papua New Guineans as well as West Papuan Communities living in Port Moresby. Port Moresby's Governor Powes Parkop facilitated the ceremony to mark the Free West Papua Campaign. This was the first ever West Papuan Morning Star Flag raised in Papua New Guinea. Governor Parkop has also organised a concert to mark the day. The concert will be held this evening at Pidik Park in the Port Moresby featuring Rise of the Morning Star Crew,Members of the Black Brothers,Sir George Telek,Twin Tribe,Lani Singers and many more. Zoals te doen gebruikelijk sturen wij bijgaand de maandelijkse WPAT-rapportage; nr. 115 inzake Papua van de maand november 2013 ter informatie. This is the 115th in a series of monthly reports that focus on developments affecting Papuans. This series is produced by the non-profit West Papua Advocacy Team (WPAT) drawing on media accounts, other NGO assessments, and analysis and reporting from sources within West Papua. This report is co-published by the East Timor and Indonesia Action Network (ETAN). This month's PERSPECTIVE covers the growing international movement for divestment in Freeport-McMoran. This reflects growing international concern on the mining operation's violations of human rights and ecological destruction in West Papua. UPDATE looks at a new report that details the Indonesian military's use of U.S. and Australian provided aircraft to devastating effect on Papuan civilians in the 1970's. A plan to create new Papuan provinces will further disenfranchise West Papuans. Despite claims by the governor of Papua province, severe Indonesian government restrictions on journalists and other international visitors to the region remain in place. An Indonesian military-linked businessmen reportedly bribed Solomon Island officials in advance of Melanesian states consideration of a Papuan application for membership in the Melanesian Spearhead Group (MSG). International NGOs and others have written to the MSG urging the regional Melanesian organization to accept the application. Merauke Integrated Food and Energy Estate (MIFEE) continues to face criticism. In CHRONICLE we note the publication of two important books dealing with West Papua; new statements by ETAN and WPAT, and a new report on the impact of the proliferation of new political districts in Papua.